Automatic Welding & Supply Corp. - Automatic Welding & Supply Corp.
Alaskan Emmett Roetman founded Automatic Welding Co. in 1958 near Merrill Field in Anchorage. In 1963 he relocated the company to its current location. During the 1970’s the company posted steady gains when it expanded its facilities and diversified its supply lines to meet mining and contractor needs. The company primarily rebuilt undercarriages (rollers, idlers, and tracks) and sold parts for crawler tractors and excavators. Roetman sold his business to his cousin Vern Christianson, Dale Davidson and Loyd Walton in 1982, one year after a fuel tanker exploded, doing major damage to the main shop. Three years later Curt McBride bought Walton’s share of the business. Just like many other Alaskan businesses, the company struggled during the economic downturn of the mid 1980’s, but with the Exxon Valdez oil spill in 1989 the business once again made steady gains. In 1991 McBride and Christianson acquired Davidson’s share of Automatic Welding & Supply Corp.
!n 2000 the company changed its focus to rock crushing, screening and conveying equipment. It began selling and servicing this type of equipment, becoming the Alaskan dealer for major manufactures including “Terex” Cedarapids, Canica, Finlay, and Simplicity. 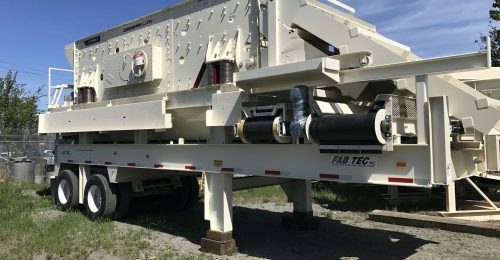 They also became the dealer for Superior Industries (Conveyors and conveying equipment), FabTec Inc (Equipment fabrication), and Eagle Iron Works (aggregate and classifying equipment). Today the company employs up to 12 people and designs and manufactures various equipment used in the mining and construction industry. This includes trailers for shaker screen units and rock crushers. Automatic Welding & Supply Corp also has its own rental fleet to service the needs of the mining and construction industry of Alaska. They are also the Alaskan dealer for The Western Grp (shaker screen wire), Columbia Steel Casting Co (crusher castings), Spokane Steel Fdry, and sell other various wear parts used in the industry including undercarriage tractor parts. Automatic Welding & Supply Corp has excelled in providing parts and service throughout the State of Alaska the past 55 years. The company ‘s reputation is highly respected and regarded by many firms that have been doing business with them over the years.